A pretty interesting and tension-filled movie about the very first event that led to the recession and how one firm discovered it. Margin Call is an interesting movie. while it’s not always easy to tell exactly what the problem is all about and what it means, the movie is as much about the ways the characters react and the solutions they come up with, as it is about anything else. understanding the specifics of the problem is not really important here. Instead, this movie is a study on how a company crumbles, and tries to keep its head afloat despite everything falling down all around it. the movie has an all-star cast and each actor is used for a very unique and memorable role. Zachary Quinto plays Sullivan, the young hot shot who discovers the problem, and during the course of a single night, brings it to the attention of more and more important people. the movie is filled with tension and excitement, and it is pretty entertaining. Margin Call is a very cool movie. it’s a movie that really puts things in perspective, or at least starts to. a few years ago, our country was hit by a major recession. 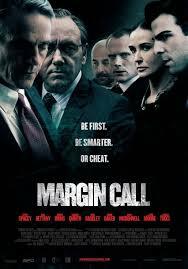 margin call starts to explain how and why it happened. even more than that, it shows how the first signs of it were discovered and what one giant firm’s reaction to it was. I wish the movie explained what it was all about a little more clearly, and often the conversations are difficult to follow, but it all other areas, this movie is pretty good. The movie starts with a number of employees of the firm being let go. an outside agency sends people in to talk to the employees one on one in conference rooms and tell them that they are losing their jobs. it is very similar to what we saw in the George Clooney movie, up in the air. one of these guys who is let go is Eric Dale, played by Stanley Tucci. he’s a guy who has been there for a while, and made it up the ladder a little bit, to the point where he now has people working under him. and they drop the news on him and only give him a little while to clear out. he needs to be escorted by a security guard everywhere he goes until he has left the building. it’s pretty degrading. And as he’s leaving, dale hands a flash drive to one of the new young guys who is working under him. this is peter Sullivan (Zachary Quinto), a rocket scientist who decided that the money was more attractive here, working for this firm, than it was doing science. dale tells him to take a look at some of the things that he was working on, but didn’t get to finish with. Sullivan does exactly that, stays at the office late one night, when everyone else goes out for drinks, plugs some new numbers in that dale hadn’t yet figured out, and is in shock when he sees what comes up. he ends up calling back to the office the two guys who he works closest with. One of them is a young guy on pretty much the same level as him, Seth, and the other one, will, is his new immediate boss (since dale left). will is played by Paul Bettany as a guy who makes a lot of money and knows how to swim clear of the muddy waters. he’s kind of a slimy character who you just don’t trust, only Sullivan does, and the two men leave their party and come back to the office to see what he found. they both stare at the computer screen and look horrified, and part of us wants to see what they’re looking at on the screen for ourselves, but the other part realizes that even if we did see it, we would have no idea what any of it meant, or what any of the numbers represented. we learn of things in this movie through dialoged. that’s really it. the guys have conversations about the state of things and we try to take away from them whatever we can. what gets annoying is when a character announces that he doesn’t understand any of this and asks the other characters to explain it to him in simple terms, and we get the explanation, and it is still incredibly complicated. this happens twice. the first time is with the Kevin spacey character, who is the next boss up from will. Spacey plays Sam Rogers, who is not making as much money as some bosses who are younger than him (such as Simon baker), and it’s probably because he has a moral conscience. after it is all explained Rogers, we get another scene where Jeremy irons (who plays the big boss, John Tuld), asks them to explain it to him like they would explain it to a child (the Denzel Washington, Philadelphia line), and of course they don’t. instead we get another complicated explanation. that’s annoying. part of the fun of this movie is just spending time around the characters. the young guys, Sullivan and Seth, for example, are pretty obsessed with how much each person at the firm makes each year. especially Seth. he treats it as a game, constantly asking Sullivan how much he thinks different people make. and sometimes they flat out ask characters, like will, and then ask him how the hell he spent that much in the course of one single year. will lays it all out for them, talking about how his costs, investments, and anything else he did with it. these scenes are important, because even though they are still about money, they take us away from the main problem of the story a little bit. they also show us how even though the paycheck amounts are truly huge, when you live in this lifestyle, it is very easy to spend all that money quickly. while the first half of the movie is about the discovery of the problem and what all of it means, the second half of the movie is about how the problem is going to be solved. the big boss, John Tuld (irons), is flown in by helicopter, and has a board room scene in the early hours of the morning (the characters have all been there throughout the night), where he discusses with his workers what they are going to do. the plan is to sell everything. the way to be successful in this business is to be first. that means selling to people and telling people that what they will be buying is a good investment, when really they know that in just hours it is all going to turn into garbage. the name of the game is selling, and price barely even matters. we watch as some of them (spacey) have moral issues with what they are doing and others (Bettany) embrace the challenge. the movie seems to drag on a little in its final scenes. it really becomes too much about the Rogers (spacey) character, who was nowhere to be found in the first Portions of this movie. suddenly he is the main character. we see him outside the building, smoking a cigarette with Sullivan and discussing his son. then we see him at home taking care of his sickly dog. we even get introduced to his wife at the very end of the film, which is just a little too late to actually care. I do like the way the movie gives us some resolutions about what will happen to each character. we learn of which ones will be getting sacked, which ones will be getting promoted, and which ones will be thrown under the bus to take the blame for the entire debacle. there’s a lot to like about this film, including the stellar cast of a list stars, and the way that tension really builds through dialogue. it’s a different kind of movie, and if only it would have tried a little harder to explain things in Lehman’s terms, I would have enjoyed it even more. still, the believable situation is that since all of them are talking to each other the whole time, and they all work there, and know this terminology, it wouldn’t have made sense for them to break down and start explaining things simply. margin call is a good movie with some pretty tense moments.